Sicilia Mia has bagged an ideal spot on the busy Westbourne Grove and is a welcome break from the chain restaurants positioned alongside it. The restaurant was opened only a couple of months ago by two Sicilian friends determined to bring relaxed, Mediterranean dining to the heart of London. With a menu that stays true to its heritage and a warming, family atmosphere, we think Sicilia Mia is on its way to fitting in nicely to this Kensington community. 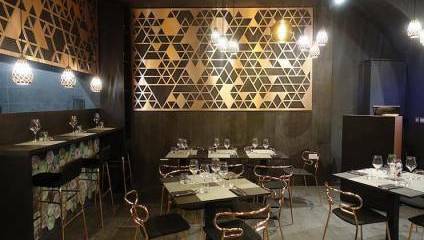 Whilst the restaurant’s walls are painted a formidable black, the rose gold soft furnishings and stylish table-wear make the intimate restaurant both appealing and cosy. The currently unused downstairs seating area is decorated with intricate garden murals and artificial hanging potted plants, evocative of Italian restaurant interiors of the early noughties. We’re welcomed warmly and offered a choice of candlelit tables. A board of rosemary Focaccia was a delightful start to the meal and encouraged us to veer away from the extensive pizza menu and instead try something new and exciting from their broad menu. Bruschetta with burrata, cherry tomatoes, oil and anchovies on a crisp bread created a balance of salty and sweet, and the cheese was soft and creamy. Alongside this we ordered a seafood salad; calamari, prawns, octopus, mussels and a hell of a lot of lemon came on a bed of mixed leaves and rocket. Sadly, expecting a warm seafood platter, this cold fish salad didn’t appeal to us as much as we’d hoped. However, this starter acted as proof of the authenticity of this menu, with a cold seafood salad not being something you’d often see at British restaurants. Regardless of the disappointment in starter number two, the portions were more than generous in size and without a doubt contained fresh, Sicilian ingredients. When in a restaurant boasting fresh pasta, you must always order fresh pasta. Hoping to try the Sicilia Mia rendition of a classic we know and love, we selected Lasagne, alongside a Lamb shoulder roll with mash potato and glazed baby carrots. The rolls were, in fact, a restaurant specialisation. As a Sicilian classic dish, many of the grilled meat and fish dishes came rolled with breadcrumbs and herbs, including the pork, salmon and swordfish. Whilst the passata element of the lasagne left a little to be desired, the pasta was definitely fresh and had an excellent texture. The Sicilian lamb shoulder was absolutely delicious, with the creamiest mash we’ve ever tried and beautifully sweet glazed carrots. At Sicilia Mia it’s clear to see that their desserts are the pride of the restaurant, having imported the cakes and tarts from master confectioners from the island of Sicily. With it comes beautiful cheese and fish which attributes to the excellent quality of the flavours. On the manager's kind recommendation, we sampled a strawberry Tronchetto fragoline and a rich chocolate and hazelnut Setteveli al cioccolato, accompanied in true Italian style by a shot of limoncello. Wherever the food lacked, the service made up for it in swathes. Warm and perfectly attentive, the charming staff encapsulated the nature of Sicilian dining. Menu prices were higher than we expected, however portions were hearty, and we were in one of London’s most luxurious boroughs. Dishes were brought out slowly, encouraging you to take your time with the meal rather than rushing you out the door to make space for another party. One of the co-owners of the restaurant spent his evening dipping between seating guests and drinking wine with friends, which encapsulates the relaxed nature of Mediterranean dining. Overall, we got the feeling of being extremely welcome, which made the experience all the more pleasant. Sicilia Mia can be found at 84 Westbourne Grove, W2 5RT and you can get more information and see the menu here.